Sure, you have your own kitchen in the suites, but sometimes you want to be looked after. Locally sourced, well cared for fodder, just as you'd hoped. We can’t save the rainforest, but we try to source our breakfast goodies from local, small-scale suppliers. Think locally-reared, grass-fed cows, snuffling pigs and free roaming chickens, producing tastier, healthier food and sustainable local communities. What’s not to like about shorter supply chains helping to keep Sussex beautiful, with the rolling pastures of the Downs and the patchwork of small, irregular fields, hedges and ancient woodland which have been maintained by traditional farming over the centuries. 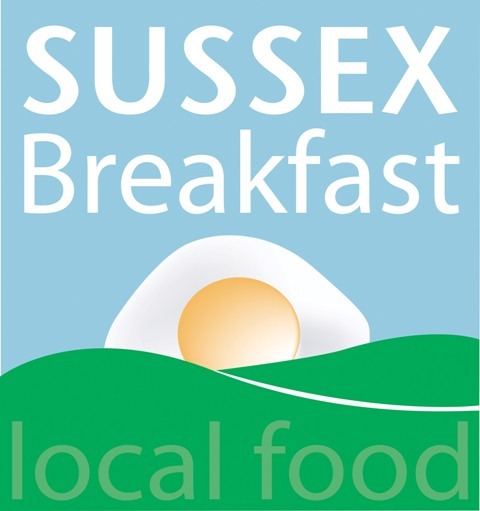 And we get to use a pretty badge awarded for Sussex Breakfasts. It’s your break so make it work for you. Breakfast in your room or at the communal table? Full Monty. Including: Eggs, bacon, sausage, mushrooms, beans, fresh tomatoes and hot buttered toast. Blimey! Perhaps you need to retain a spring in your step for the hike along the Seven Sisters. There is plenty to choose in the buffet, including squeezed juices, local breads, yoghurts, fruit and cereals. All for a fiver. Six of our rooms have their own kitchens - so you can prepare food when it suits you.